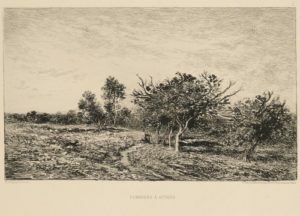 This print was made a year before Daubigny’s death in 1878. A peasant figure makes a path through the landscape equipped with tools for the cultivation of nature. The scene depicts a harmonious partnership between rural inhabitants and their surroundings. 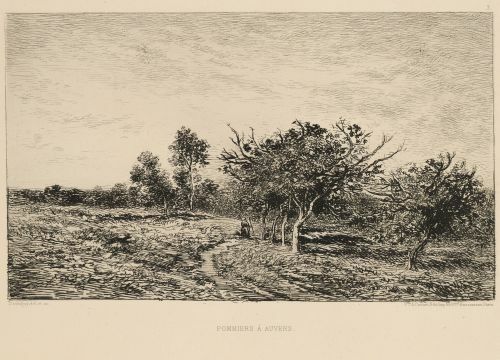 Daubigny chose to represent countryside over urban life throughout his career. Daubigny’s depictions of country life may have influenced artists associated with Impressionism during this period. From a volume of four years of ‘L’eau-Forte’ published by Alfred Cadart, 1878.